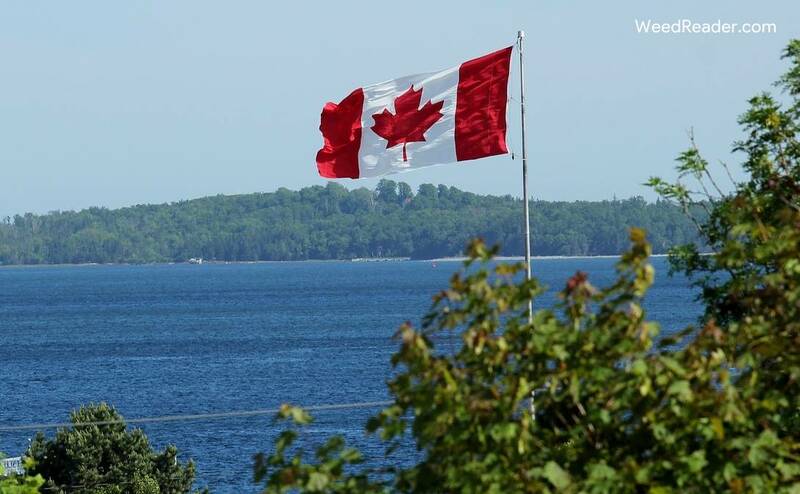 In June, Canada’s Senate voted 52-29 to approve the Cannabis Act, making it the second country in the world to legalize recreational marijuana nationwide (Uruguay was the first, in 2014). 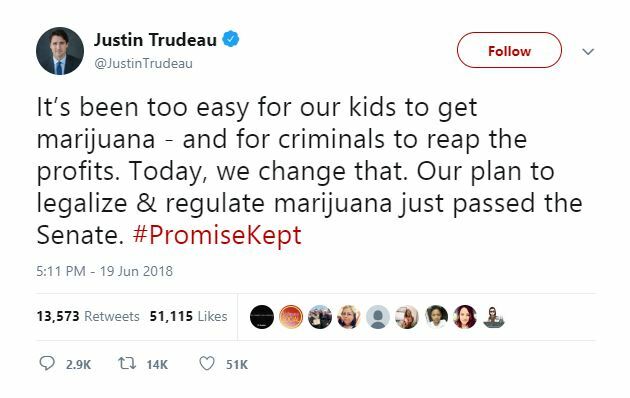 Prime minister Justin Trudeau and his liberal party have been pushing for legalization since 2015. Their mission is to get pot off the black market, thereby reducing crime and the demands on law enforcement, while also increasing regulation, public health and safety. The new law will make it legal for adults – age 18 or 19, depending on the province – to possess up to 30 grams of pot, and cultivate up to 4 plants. It also establishes a nationwide, legal marijuana marketplace, with each province deciding on it’s own rules and regulations. But don’t start celebrating just yet, because the bill won’t take effect until October 17th – and pot is still very much illegal until then. The new law also doesn’t legalize all kinds of cannabis products overnight. It doesn’t apply to cannabis-infused edibles or beverages, for instance. The government has said that these products pose special regulatory challenges – like dosage and portion sizing – and it needs more time to consider these factors before it opens up these markets. How long, exactly? Regulations should be in place sometime in 2019, according to a spokesman for Canada’s health minister. Until then, keep this in mind: Canada has decided to delay the sale of marijuana edibles, not their possession or use. So if you prefer to ingest your pot, it’s perfectly legal for you to make your own at home. So by all means, dust off those cannabis cookbooks and whip up a batch of your favorite brownies. Or try out some of our recipes, like these Fudge-You-Up brownies, or chewy pot cookies. We’ve also got recipes for cannabis tea and hot chocolate. Another product that won’t be available for purchase (legally) in October is marijuana oils and vape juices. Before these products hit the market, the government needs to figure out how to regulate their processing, quality, potency, etc. Again, the government plans to have these regulations in place sometime next year. Until then, you’ll just have to smoke your herb the old fashion way. Or you could try out a CBD vape oil as alternative, to hold you over until other products hit the market. Non-psychoactive CBD e-juices have long been available through Canada’s medicinal marijuana market, and online retailers abound. The Cannabis Act is a huge step forward for Canada, and a shining example to other countries around the world. One of the reasons for the delay in rolling out edibles and vaping products is the lack of precedent. Canada, along with some U.S. states, are essentially blazing a new trail here, and it takes time to figure out the best way forward. But with the cannabis industry projected to become a multi-billion dollar market, the trailblazers are in position to reap the greatest rewards. Made of an all natural Organic blend of Coconut Oil & our propriety blend of Organic Hemp, Avocado & Flax seed Oil.